Western blot analysis of whole cell lysates probed with E3 ubiquitin-protein ligase CBL antibody followed by detection with HRP conjugated Goat anti Mouse IgG (1/10,000, STAR207P) and visualized on the ChemiDoc™ MP with 16 second exposure. Arrow points to E3 ubiquitin-protein ligase CBL (molecular weight 120 kDa). Mouse anti-human E3 ubiquitin-protein ligase CBL antibody recognizes E3 ubiquitin-ligase CBL, also known as casitas B-lineage lymphoma proto-oncogene, proto-oncogene c-Cbl, RING finger protein 55 or signal transduction protein CBL. Mouse anti Human E3 ubiquitin-protein ligase CBL antibody recognizes E3 ubiquitin-ligase CBL, also known as Cas-Br-M (murine) ecotropic retroviral transforming sequence, RING finger protein 55, casitas B-lineage lymphoma proto-oncogene or proto-oncogene c-Cbl. The CBL gene is a proto-oncogene that encodes a RING finger E3 ubiquitin ligase. The encoded protein is one of the enzymes required for targeting substrates for degradation by the proteasome. This protein mediates the transfer of ubiquitin from ubiquitin conjugating enzymes (E2) to specific substrates. This protein also contains an N-terminal phosphotyrosine binding domain that allows it to interact with numerous tyrosine-phosphorylated substrates and target them for proteasome degradation. As such it functions as a negative regulator of many signal transduction pathways. CBL gene has been found to be mutated or translocated in many cancers including acute myeloid leukaemia. Mutations in CBL are also the cause of Noonan syndrome-like disorder (NSLL) (provided by RefSeq, Mar 2012). 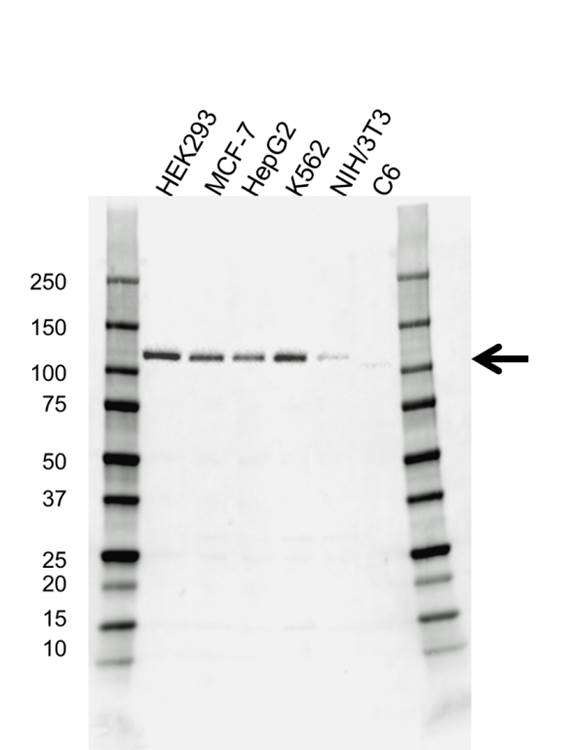 Mouse anti Human E3 ubiquitin-protein ligase CBL antibody detects a band of 120 kDa. The antibody has been extensively validated for western blotting using whole cell lysates.